Start thinking savory for breakfast. This will open up an entire world of options for both vegetables and protein. This meal consisted of whole wheat pancakes, steamed spinach with garlic and butter, leftover chicken, sushi (yes, sushi for breakfast! 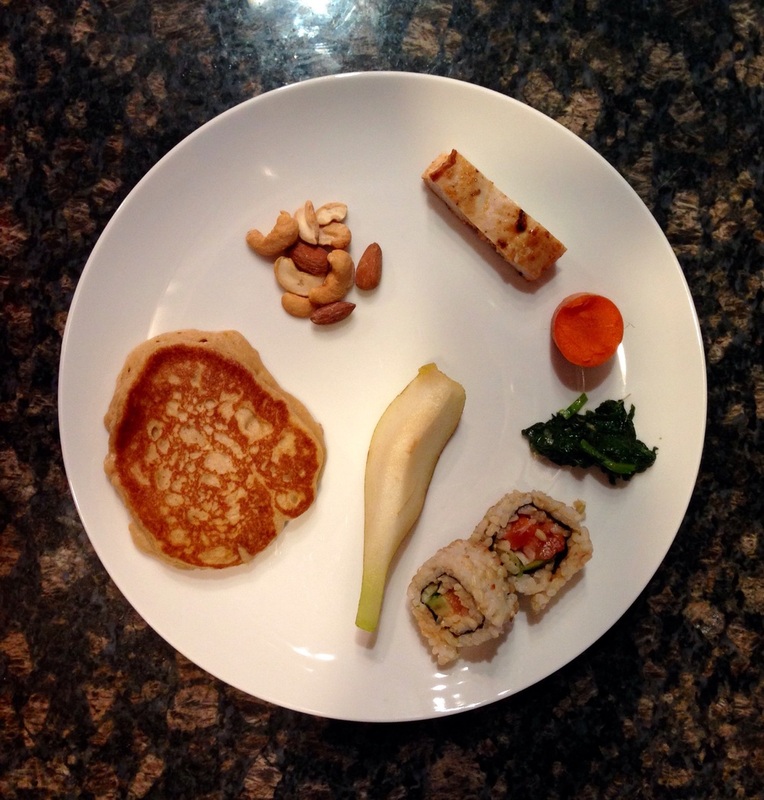 ), raw carrots, cashews and almonds, and some Concord pear. Note the portion sizes! 1. In a medium bowl, whisk egg until fluffy. Add flour, sugar, salt, and baking powder to bowl. 2. Place cinnamon and vanilla into measuring cup and whisk. Add milk to measuring cup an whisk until just combined. Pour into bowl. 3. Add olive oil to bowl. Whisk ingredients until smooth. Wait 2 minutes for batter to rise, then whisk again until smooth. 4. Melt 1 teaspoon ghee in pan. Ladle in batter making palm-size pancakes. Cook 1-2 minutes, flip, and cook another 1-2 minutes. These pancakes are great plain if you like more of a biscuit flavor. Drizzle with some organic grade B maple syrup to sweeten. Enjoy!